When setting up availability groups in SQL Server 2012 we have a new set of Windows cluster resources that appear within our Cluster Management console. These new resources are the availability group name, the availability group listener name and the availability group listener IP address. The last two are present if you make use of the availability group listener functionality. Within SQL Server 2012 Management Studio you have the availability group dashboard to show you the state of the system, which database is the primary replica, which is the secondary, and any transitions in state between primary and secondary. In your own environment you’re probably looking after conventional Windows failover cluster instances of sql server. You’d, in effect, be monitoring two types of dashboard – the AG dashboard and the Windows Server Manager. Given that an availability group is represented as just another clustered resource it’s possible to monitor at the level of the common denominator. That is, just use the Windows Server Manager. So you can see the transition of just the availability group resources from offline pending to online as the database on INSTANCE1 changes to become the secondary and the database on INSTANCE2 changes to become the primary. 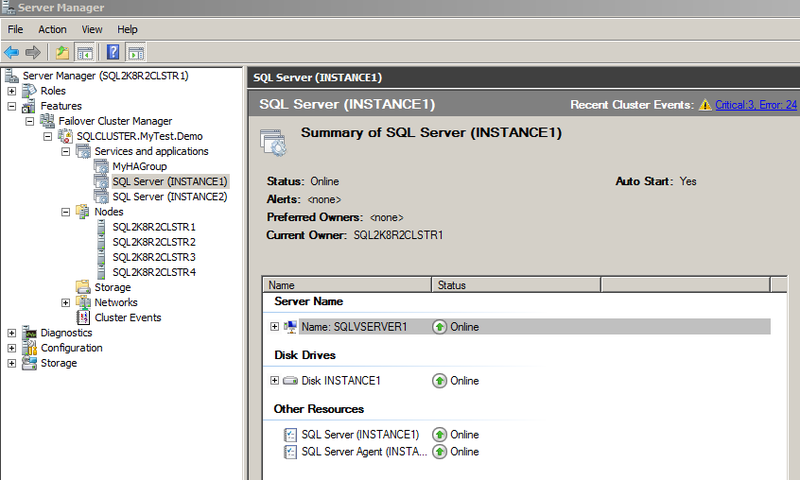 Notice that there are no change events for any of the FCI instance resources for the INSTANCE1 and INSTANCE2 sql servers. It’s just the availability group that’s failed over. I’ve moved the FCI INSTANCE2 from node 2 to node 3. The output confirms this is just a regular failover for a FCI sql server instance. The availability group clustered resources do not change. From the output you can see that there are state changes for both the AG cluster resources and the FCI cluster resources as they make their way to node 2. It’s interesting to note these transitions for the complex case of an availability group defined across two failover cluster instances, all by necessity defined on the same windows cluster. The point of this post is that from an alerting point of view if the key aspect you’re looking out for is a failover then you can use the above listed Powershell script as the basis for generic monitoring for both failover cluster instances and availability groups. Register-WMIEvent does take -ComputerName as a parameter so it’s possible to run the monitoring from another machine. The script is not SQL Server specific. It can be used to monitor changes in state for any of your clustered resources. You can modify the action clause of the commandlet to alert in any number of ways.